When setting up for a trade show booth, you have to consider several things to ensure that your booth is a success. While your budget and jewelry to sell are both essential to setting up a trade show booth, it will be your necklace display stands, earring holders or watch display boxrs that can do a lot to get you more sales. 1. Setting up a portable jewelry booth is not easy, especially in a trade show where you will be competing with several other jewelry booths who may or may not sell the same things as you do. By using various easy-set-up display towers and trays, you won’t have to worry about bringing in heavy equipment or taking long hours just to make sure that you get a functional and attractive display. Earring towers can easily be folded so when you set up and pack up, you can do so with the earrings still hanging on them. This saves you a lot of time and effort. 2. Having towers and trays to openly display your jewelry also allows customers and passersby to easily see your jewelry. They won’t have to ask you if you have a similar piece or a specific type of jewelry. 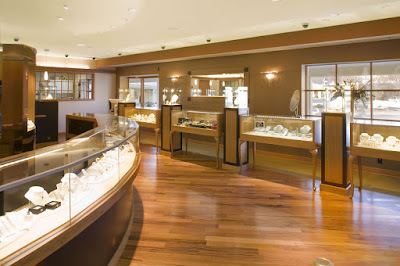 Not only that, if the jewelry is freely displayed, customers can pick them up to check it out or try it on. Usually, this is how a customer decides if they want to buy something. If the jewelry feels and looks nice on them, only then will they decide to shell out some cash. It’ll also be wise to have mirrors set up in your booth too. 3. When you’re in a trade show competing with many others for the attention of your customers, you need to be creative in order to attract customers. The only way you can do this is to set up your jewelry with a unique display. The more creative and the more unique your display is, the more they’ll find themselves attracted to your booth. The best way to get your display noticed is to make sure that your jewelry gets displayed openly, in a creative theme, with a variety of display equipment. If you need to find display items for your next trade show expo, Nilecorp offers a wide variety of jewelry display and packaging items to make your booth as unique as possible. Having an interesting and creative jewelry display has its perks for store owners. However, if you can provide various ways for people to wrap their jewelry, you might just have an edge over other jewelry stores. Depending on the specific dates and occasions, here are some creative ideas for you to wrap your jewelry (at the request and possible additional fee for the customer, of course). 1. Popular for rings, you can put the ring in a small box and have it wrapped nicely. Then put this box in another slightly bigger box with a different wrapper again. Once you've finished, put the bigger box in another bigger box and continue doing until the box is much, much bigger than its original size. Have the box wrapped, exquisitely before handing it back to the customer. Not only does the size throw off the recipient of the gift, the unwrapping process is also a fun activity. 2. Using bottles as your wrapper may be insane, but very creative as well. Tie the jewelry (most recommended – rings or earrings) with a long lace, ribbon or a strong piece of yarn. Push the jewelry into a clean bottle of wine or champagne and tie the end of the lace or ribbon outside of the bottle. Wrap the bottle nicely with shiny wrappers and ribbons so the recipient would have no idea what they’re actually receiving. 3. By using a paper towel holder, wrap the ring or small piece of jewelry and place it inside the holder. Decorate the holder with colorful confetti so that once the recipient starts looking for the gift, the confetti will start flying around, creating a slightly cheesy, but definitely romantic way to open up a gift. 4. When you’re using jewelry boxes or other supplies, use bubble wrap to provide a little mystery to the gift and allow the recipient to have some fun while opening the gift. If you happen to be using the tip #1 in this article, you can also add bubble wrap to the mix so it’ll be harder for them to open and find the gift for themselves. Some people who buy jewelry don’t have all the time to wrap it up themselves. Maybe you can think of offering special wrapping services to help your customers present creative and romantic gifts to their loved ones. When you’re running a jewelry shop, it’s not just the attractive jewelry display that you need to worry about. In fact, there are several factors that will help you attract the attention of customers and potential clients. One of these factors includes wrapping your jewelry for your customers. While not everyone takes note of the packaging of each piece of jewelry, if the packaging is attractive enough, it is the best way to freely advertise your business and get more people to your shop. One of the best ways to wrap your jewelry is to make sure that it is placed in a secure and creative-looking case. Use a resealable polybag to protect your jewelry once it has been bought. The resealable bag allows you to keep your jewelry away from any harmful environmental elements that may ruin the beauty or colors of your jewelry. This way, once you wear your jewelry, it’ll still look as clean and pretty as it did when you bought it. If you think a resealable bag is too simple, you can also add a drawstring pouch to the mix. These drawstring pouches are cheap and they can be printed out with your business’ logo and contact details for future advertisement purposes. A pouch can help you to add design to the jewelry’s packaging. You can also choose pouches according to its colors and sizes. Pouches are usually used when selling earrings, bracelets or costume rings. On the other hand, if a resealable bag and pouch is too much, you can always use small boxes to place your jewelry inside. Usually, jewelry display suppliers can provide these jewelry boxes ready-made in various colors just for your jewelry. Each box also contains cushions that will protect your jewelry from scratches. Once you’ve placed the jewelry inside the box, you can wrap it with colored ribbons to add aesthetics to the package. Boxes are the best choices for packing rings, earrings and necklace from jewelry displays (especially engagement and wedding rings). To finish off your packaging for your jewelry, you can add a tote bag to the mix. Tote bags are small, elegantly and creatively designed paper bags which can easily carry jewelry boxes or pouches. This way, customers can bring their jewelry fashionably, wherever they want. Making jewelry can be a lot of fun for just about anyone. However, for the people who happen to be business-minded and creative at the same time, it can be a lucrative hobby as well. In order to be able to sell jewelry, placing jewelry blankly on top of a table isn’t enough to get people to buy. You need to build an aesthetic environment around the jewelry, for it to attract more customers. Having a creative, smart and effective jewelry display will help you earn more profit. Unfortunately, creating an effective display isn’t all that easy or cheap, but nowadays, anything is possible as long as you’re willing to be creative and resourceful. Just to give you some ideas, here are some cheap, but interesting ways to display your jewelry. Fabric is one of the best and cheapest ways to display your jewelry. Aside from the fact that it’s cheap, you can also use old fabrics at home to create an attractive display for your jewelry. By using books, you can stack them up under the fabrics to create levels of display. On the other hand, you can also use the fabric to help customers see how the jewelry looks on a style or color of an outfit. Accentuate the whole display with other attractive embellishments like magazine pictures and other antique displays. If you’re into carpentry and have some experience building various ornaments, you can use this talent of yours to create risers and tiny towers out of old wood, metal and other materials. Star risers are easy to build and it provides a way for you to display your necklace, earrings, watches and pendants in different heights, emphasizing those in different styles and colors. To add an aesthetic look, you can also paint your homemade pieces with different colors to match the jewelry on display. To build a star riser, all you have to do is cut pieces of plywood to the length and height you prefer. Then nail a vertical piece of plywood to a horizontal piece, forming a “star”. The colors of nature make a perfect background for different kinds of jewelry. With the inspiration of Mother Earth and the colors brown, blue and green, you can easily make a nature-inspired display for your jewelry. Use star risers, made out of wood, antique, wooden embellishments and fabric to help you create your nature display. You can also use stones, branches and rugged wood to help you finish off the nature look. Being able to sell depends on how creative you can be with your jewelry. But it doesn’t mean that you have to spend too much on the display itself. Keep an open eye on the latest trends too, because these might help you think of creative display ideas. Although there are a large variety of jewelry display trays available for sale, the challenge is not to simply buy these trays but to find one appropriate for your store. As a jewelry seller, it is important to buy display trays that will help you to protect your jewelry and at the same time, provide you with the option of displaying it aesthetically. Unfortunately, before you can pick up a tray and shell out some money, you need to know what to check first to ensure that the tray you choose will not break easily, at least for a reasonable amount of time. The first thing you need to know is where your tray was manufactured. While low-income countries may offer cheap jewelry display sets, you need to measure its worth with the quality you’re getting. Since products like display trays are commonly manufactured on a mass basis, there’s a chance that a low-quality product would’ve passed through quality control. On the other hand, there are also other manufacturers from other countries that may be able to offer you a similar piece for a higher price. While these may have gone through a more thorough and stricter quality control team, it is important not to be too quick to be blindsided by its price. After all, a more expensive product doesn’t necessarily mean higher quality. Now that you’ve considered the place where your jewelry tray was manufactured, you should also check the materials of your necklace display trays, earring showcase trays and stackable ring trays . Some trays are made of inferior velvet, some plastic, while others are just simply made out of low quality raw materials. The problem with low quality raw materials is that it eventually breaks easily and if it contains your precious jewelry, you might have to pay more than you bargained for. Luxury jewelry sellers also opt to color coordinate their trays with the jewelry just to add aesthetic value to their window display. Last, but definitely not the least, it is important to consider the price of your display tray. While high quality trays are definitely much more recommended, if your shop cannot afford it as of this time, it might not be right to risk all of your capital on the purchase of your display trays. Instead, you can mix it up a little, especially if you also have cheaper jewelry for display. Picking out a tray for your jewelry isn’t all that easy. You need to be smart and resourceful in order to get the best quality out of the budget you have. Before you settle on just any display seller, make sure to take your time checking out various sellers, just in case you might find a better and more reliable option. Managing a jewelry store can be fascinating and frustrating at the same time. There are so many things you have to take care of, so many things to do, in order to keep your customers interested, all the time. One of the things you’ll need to do is find, buy or make the type of jewelry to sell at your jewelry shop. What kind of jewelry shop are you setting up? The answer to this question greatly relies on what jewelry pieces to sell. If you happen to own a jewelry shop that sells only genuine jewelry, then you may want to consider selling designer lines. There are also several lines catered to a celebrity’s fashion sense and you can make use of this to attract fans of actors and actresses. Jewelry lines like the Style of Jolie, a collaboration between the actress Angelina Jolie, herself and Robert Procop, not only attracts attention, but also shares credibility and reputation from the fashion icon herself. If you own a traditional jewelry shop with unique pieces, you can also collaborate with other jewelry makers, in order to make another unique line and attract more customers. Be sure to stock up on jewelry supplies for your creative pieces. This way, your shop can offer more designs and styles to your customers. What kind of jewelry display do you have at your shop? This is an important question because it will also measure the capacity of your jewelry store. Sure, you’ve bought wholesale jewelry displays already, but if you’re planning to expand and maybe add variety to your jewelry, will your racks and towers handle the type and amount of jewelry you’re about to add? If you’ve signed on to sell a new type of jewelry line, will it fit the acrylic hands, mini necklace and pendant display and mannequins in your store? Or do you have to buy new displays? Remember, setting up shop is not an easy process and it is a continuous learning experience. Not only will you have to consider the latest trends, you’ll also have to consider your budget. Setting up shop must not be easy, especially for those who don’t have a lot of experience with business or selling jewelry. Jewelry sellers have to be blessed, not only with the talent of making jewelry, but with creativity as well, in order to ensure that the shop being set up will greatly mirror the type of jewelry to be sold. But before you can open up shop, you’ll also have to consider the different types of jewelry display stands that you may need. There are several types of jewelry display cases to store necklaces. All you have to do is pick the one that will suit your store and budget most. The most common type of display for necklaces are those in mini-boxes, decorated with a soft back for proper placing, along with earrings and bracelets for sets. You may also want to consider purchasing necklace display boards, which have a stand at the back so the necklace can lay and be properly displayed to customers. For those with bigger budgets, an acrylic neck display may be worth purchasing too. Earrings are easier to display too, but it takes creativity to make a pair of jewelry stand out among the rest. Usual choices for earring displays are hook rotators and earring boards. However, shop owners can also use wire displays so the earrings will be more appropriately displayed above the counter. Another option would be those rotating towers, which serves as a convenient display for a number of earrings. Usually, owners will purchase bracelet ramps in order to display their collection of bracelets. But nowadays, if there is a neck display for necklaces, there’s also an acrylic hand display where you can easily set up bracelets on make-shift wrists just to show customers how the bracelet looks when worn. These are definitely more expensive; however, customers appreciate jewelry more when they can see it worn on a wrist, even if it’s only a display. If you’re also selling very expensive pieces of jewelry, attaché cases are the best way to get them on display and protect it from any environment risks. Once you have your jewelry display cases and stands, you’re now ready to start designing your shop. While everyone is down at the park or local fair celebrating the 4th of July, those with businesses will have to take advantage of the occasion, in order to sell more. Since 4th of July means that half of the country will be on holiday, this only means more profit for those in the business of selling goods. This means stores that sell food, clothes, jewelry and necklace display stands will have to stay open, even on the most awaited celebration of the year. But as a sales business, how can you attract more customers and stand out among your competitors? Although a popular marketing strategy, businesses still use this opportunity and bundle up 4th of July appropriate items for a discounted price. Shops can put together essential items or even complementary products and sell it as a package, attracting those who love discounted items. Not only will businesses get to make bulk sales, they can also attract more people to their store for the special day. Even if this is a common marketing strategy, people will still patronize the store – especially if the rate of discount is big enough to attract attention. Businesses can either cut down on prices or settle on marketing strategies like “buy two, take one” or “buy two, get a freebie” to attract the attention of customers. Discounts are definitely appreciated during the 4th of July holiday, so offering these will be beneficial for the business. In order to attract attention, not only should the business focus on discounts and bulk sales, but they should also make sure that the shop itself is attractive to customers. Make customers feel the 4th of July celebration by setting up decorations in the store. Get themed, unique jewelry display or blue and red hangers for your items to match the celebration of the nation. Basically, in order to sell on one of the widely celebrated holidays in the country, you have to attract customers first with your 4th of July decorations and then keep them interested with your sales and discounts.